I’m still building my catalog of go-to recipes. To become a “go-to” it needs to be made several times and you need positive reviews from someone other than yourself. And of course – it needs to be a somewhat easy and approachable recipe! One of my tasks at hand this summer was finding a few go-to zucchini recipes. In particular: sweet, carby, delicious ones – because pregnant Lauren has had a very depressing aversion to many vegetables in their healthy form. 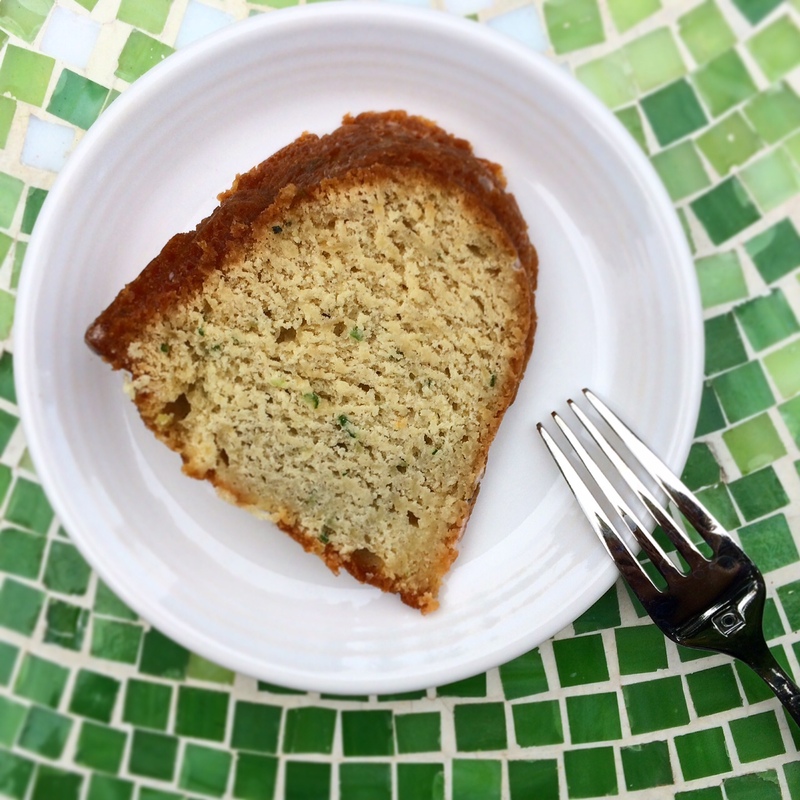 Success came in this modest Zucchini Pound Cake from the Joy the Baker cookbook. It’s easy and delicious, and you have a few good modification options depending on what kind of mood you are in. 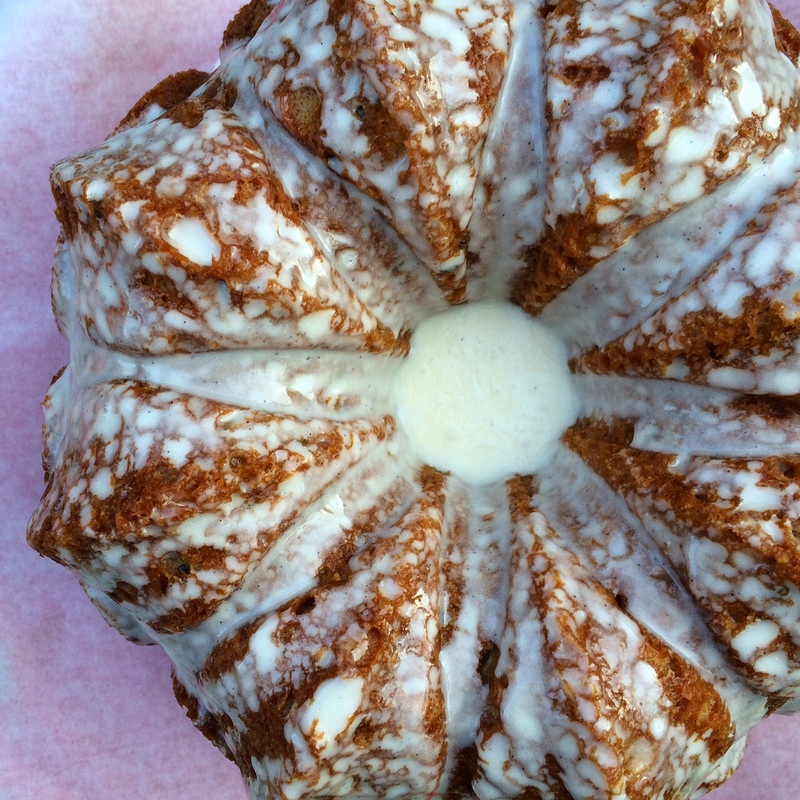 My modification was adding a basic vanilla glaze instead of adding cream cheese frosting. A lemon glaze would also be good, or you could always go the CHOCOLATE route! Whatever you choose, this is a great basic zucchini cake recipe that impresses a tad more than plain old zucchini bread. Just be careful of the bake time – my cake took a lot longer to set than the original recipe instructed. Preheat oven to 350F. 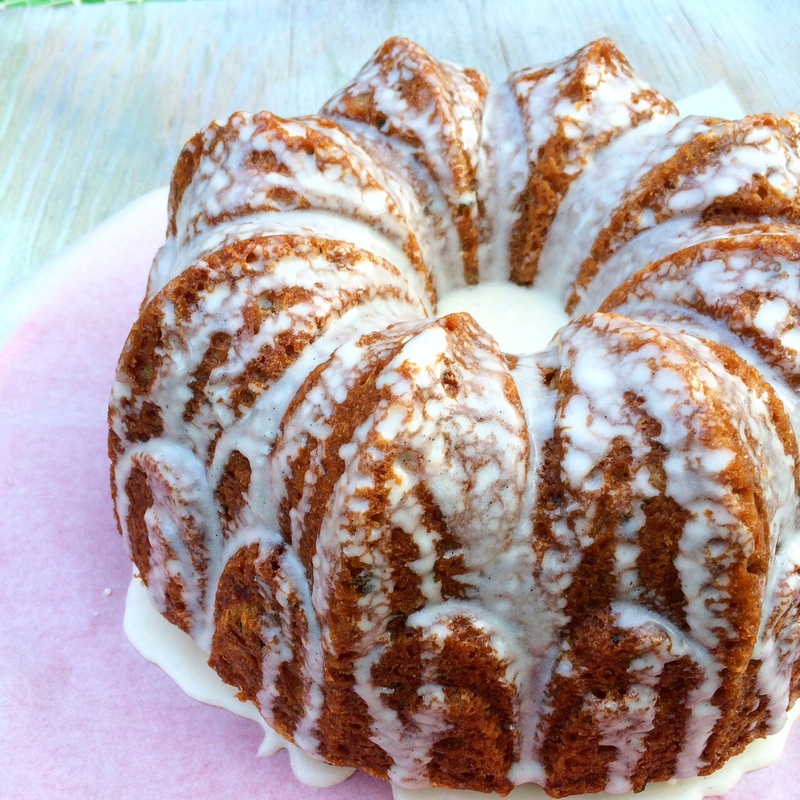 Spray a 12 cup Bundt pan with baking spray and set aside. To get going, make sure you shredded some zucchini. I use an attachment on my food processor for super easy shredding. Since zucchini is really watery, I like to try to extract some moisture. Straining, blotting with paper towels, whatever works. 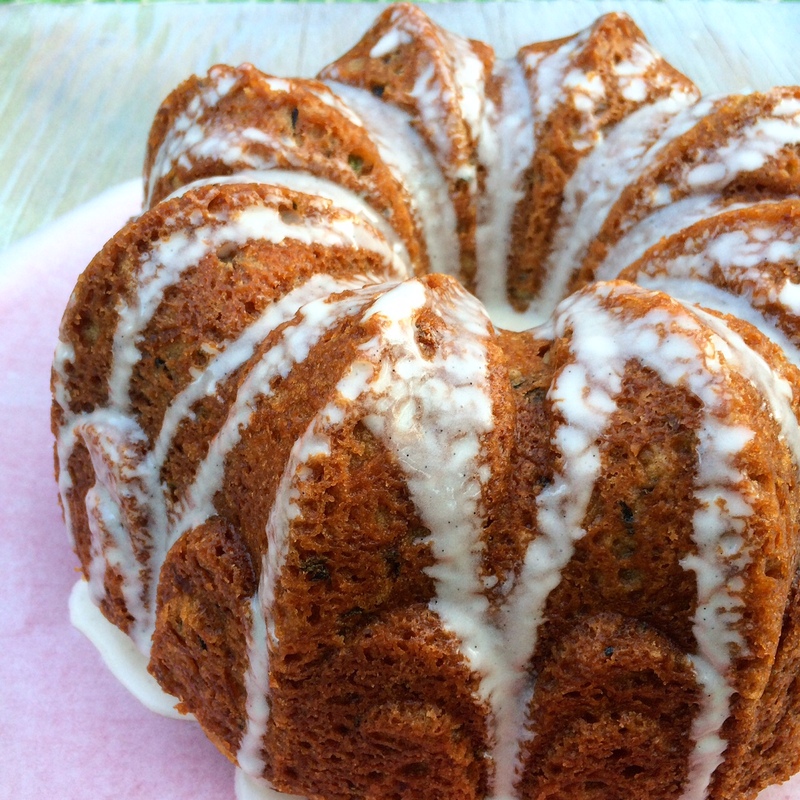 You just don’t want super watery zucchini going into your cake! In the bowl of an electric stand mixer fitted with a paddle attachment, beat the cream cheese and sugar on medium speed until well incorporated, about 2 minutes. Add eggs, one at a time, beating for 1 minute between each addition. With the mixer on on low, add vanilla, then pour in the melted butter and increase speed to medium high to beat until nice and smooth, about 3 minutes. Reduce mixer speed to low and add the flour mixture to the batter all at once. Beat until just incorporated. Remove the bowl from the mixer and gently fold in the zucchini, make sure all of the flour is incorporated. The batter will be thick! Spoon batter into prepared pan and bake for at least 55 minutes, until a skewer inserted in the center comes out clean and the cake is browned. Remove cake from oven and allow to cool in the pan for 20 minutes before inverting onto a wire rack to cool completely. To make the glaze, whisk together the powdered sugar, milk, vanilla extract, and salt until it forms a thick glaze. I usually whisk in a little melted butter to my glazes to level out the raw sugar taste, and also because butter makes everything better. Slowly pour glaze over the cooled zucchini cake. Serve right away or the next day. The glaze soaks into the cake after the first day, but this isn’t a bad thing!